The Russian Navy has put into service seaborne ICBM Liner designed by the Makeyev State Missile Center based in Miass, Chelyabinsk region, a source from the Russian defense sector said. "The ICBM Liner system was put into service in the beginning of this year. 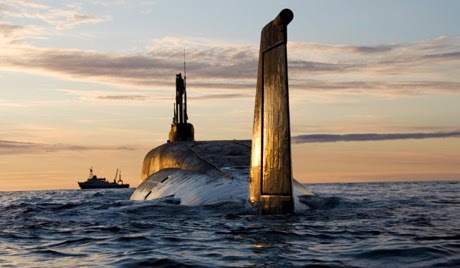 These missiles will be deployed on nuclear-powered strategic submarines of Project 667BDRM," he added, Interfax reports. According to open sources, ICBM Liner can carry a multivariate warhead in contrast to its predecessor, ICBM Sineva. The Sineva warhead consists of four units, and ICBM Liner can carry either ten small-sized warhead units capable of penetration through missile defense or eight units of the same class but with a higher capacity for missile defense penetration or four medium-sized units with missile defense penetration capacities. ICBM Liner was successfully test fired on May 20 and September 29, 2012. ICBM Sineva and Liner will make it possible to extend the period of operation of missile carrying submarines of Project 667BDRM until 2030. Some experts point out that it would not be quite right to call ICBM Liner a brand new missile. "In fact, this is the same Sineva, but with a different, better warhead," one analyst said. He recalled that Liner was the project name of a new warhead rather than a missile. "This theory is supported with the meager number of test launches of the 'new' missile, which was tested as Sineva a long time ago, and the similar indication of both missiles, R-29RMU2 for Sineva and R-29RMU2."